A series on low back pain by the global medical journal The Lancet outlined that most sufferers aren't getting the most effective treatment. The articles state that recommended first-line treatments – such as advice to stay active and to exercise – are often overlooked. Instead, many health professionals seem to favour less effective treatments such as rest, opioids, spinal injections and surgery. So, here's what evidence shows you need to do to improve your low back pain. The cause of most people's low back pain remains unknown. But we do know of a number of risk factors that could increase the chance of developing low back pain. These include a physically demanding job that involves lifting, bending and being in awkward postures. Lifestyle factors such as smoking, obesity and low levels of physical activity are also associated with developing low back pain. In Australia, physiotherapists, chiropractors and osteopaths use manual and physical therapy to treat lower back pain. The treatments often include some form of spinal manipulation and massage, as well as advice to stay active and do exercises. This is consistent with The Lancet's recommendations, also based on evidence from studies. Physiotherapists, chiropractors and osteopaths are required by law to be registered with the Australian Health Practitioner Regulation Agency (AHPRA) to practise in Australia. To be registered, a person must complete a minimum of four years' study at a university in a degree that includes a focus on non-pharmacological (drug-based), non-surgical management of musculoskeletal conditions, including low back pain. 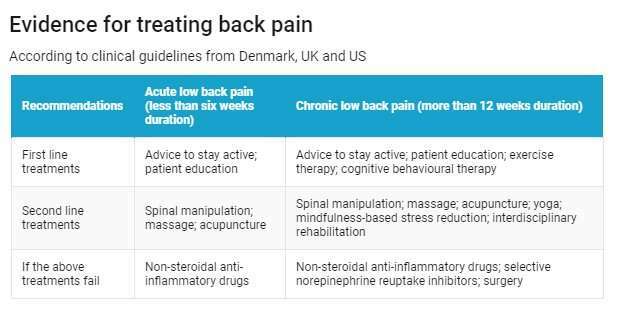 Under the government's Chronic Disease Management Plan patients with persistent low back pain may be referred to physiotherapists, chiropractors or osteopaths for evidence-based therapies such as spinal manipulation and massage. If patients are unfamiliar with these therapies, they can discuss referral with their GP. One thing to look out for when you see a practitioner is the number of treatments they recommend. Patients usually start with a short course of two to six treatments to see if the treatment helps. It shouldn't take many treatments for a change in symptom pattern to become obvious.